Websearchthis.com is a browser hijacker, the one responsible for your browser’s settings. While some experts refer to hijackers as redirect viruses, they are not malware, thus should not harm your computer directly. It is very easy to notice a hijacker infection because your browser’s settings are changed and something else is set as the homepage and new tabs. 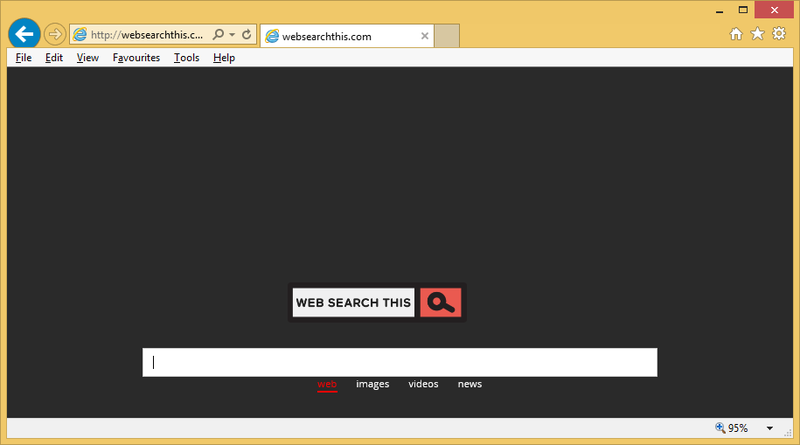 In this case, Websearchthis.com will appear every time you open your browser. There is no reason why you should put up with this hijacker and Websearchthis.com elimination is strongly encouraged. The reason for that is because the hijacker might try to expose you to sponsored or even malicious content. Hijackers do not care about what content you are exposed to as long as you are. After all, it’s how they make money. We suggest you uninstall Websearchthis.com the moment you notice its presence. All browser hijackers spread using software bundles. And to infect as many people as possible, hijackers are attached to free software as extra offers that need to be deselected to prevent their installation. It can only be done in Advanced or Custom settings. When you choose those settings during freeware installation, everything that has been added will become visible and you will be able deselect all. Default settings will not allow you to do this, you will not even be informed of anything being attached. Unless you enjoy having to delete Websearchthis.com and similar, we suggest you take our advice seriously and always use Advanced. Like is typical with hijackers, Websearchthis.com will make changes to leading browsers installed on your computer and set itself as the homepage as well as new tabs on all of them. So every time you launch Internet Explorer, Google Chrome or Mozilla Firefox, you will be redirected to Websearchthis.com. And if you try to change the settings, you will not be allowed to since the hijacker will keep altering them after you. So you are stuck with the homepage until you uninstall Websearchthis.com hijacker. It is very obvious if you have this particular infection because the website looks very different from legitimate search engine sites. It has a dark background and a search box. If you were to search for something, you would be redirected to Google. Obviously, it is a completely legitimate search engine. One you can access very easily, we might add. There is no need to use some questionable website. Delete Websearchthis.com browser hijacker. Browser hijackers are difficult to locate so that could make manual Websearchthis.com removal complex and time-consuming. You can still try, however. We will also provide instructions below this article to help you. The other option is obtaining anti-spyware software and having it remove Websearchthis.com. Whichever way you pick, make sure you erase Websearchthis.com fully so that it cannot renew itself again.